The Great Fire of London happened in London, 1666. The fire lasted for three days, from 2 September until 5 September. It threatened the aristocratic district of Westminster (the modern West End), Charles II's Palace of Whitehall, and most of the suburban slums. However, it did not reach these districts. It burned down 13,200 houses, 87 churches, Old St Paul's Cathedral, and most of the government buildings. It is believed that it destroyed the homes of 70,000 of the 80,000 people that lived in the city. It is not known how many people died in the fire. Only a few deaths are certain, but for many of the victims there were no records. The fire started at the bakery of Thomas Farriner (or Farynor) in Pudding Lane. It began just after midnight on Sunday, September 2 and grew very fast. Firefighters of the time usually made firebreaks by destroying buildings around the fire so it could not spread. This did not happen soon enough because the Lord Mayor, Sir Thomas Bloodworth, was not certain what to do. By the time he ordered such measures, it was too late. The fire pushed north on Monday into the center of the city. Some people thought that foreigners were setting the fires. They believed it was the French and Dutch. Both countries were England's enemies in the Second Anglo-Dutch War, a war that was happening at that time. On Thursday, the fire spread over most of the City, destroying St. Paul's Cathedral and crossed over the River Fleet. It was close to setting fire to Charles II's court at Whitehall. The strong east winds slowed down. These winds were causing the fire to spread. The Tower of London guard used gunpowder to make good firebreaks that stopped the fire from spreading to the east. The social and economic problems created by the disaster were very big. 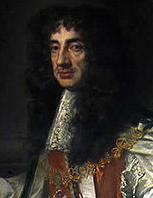 Leaving London to go and live elsewhere was strongly encouraged by Charles II. He feared a London rebellion amongst the refugees who had lost their property. Despite numerous radical proposals, London was reconstructed on essentially the same street plan used before the fire. The fire is said to have also helped to get rid of the Great Plague which had hit London in 1665, and killed about 70,000 of the 90,000 population. 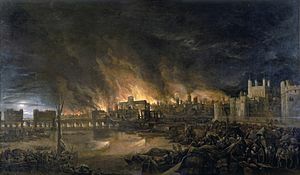 The Great Fire of London by an unknown painter, depicting the fire as it would have appeared on the evening of Tuesday, 4 September 1666 from a boat in the vicinity of Tower Wharf. The Tower of London is on the right and London Bridge on the left, with St Paul's Cathedral in the distance, surrounded by the tallest flames. Central London in 1666, with the burnt area shown in pink. "Firehooks" used to fight a fire at Tiverton in Devon, England, 1612. An advertisement for a comparatively small and manoeuvrable seventeenth-century fire engine on wheels: "These Engins, (which are the best) to quinch great Fires; are made by John Keeling in Black Fryers (after many years' Experience)." "It made me weep to see it." Samuel Pepys (1633–1703) painted by John Hayls in 1666, the year of the Great Fire. The London Gazette for 3–10 September, facsimile front page with an account of the Great Fire. Click on the image to enlarge and read. John Evelyn (1620–1706) in 1651. Ludgate in flames, with St Paul's Cathedral in the distance (square tower without the spire) now catching flames. Oil painting by anonymous artist, ca. 1670. 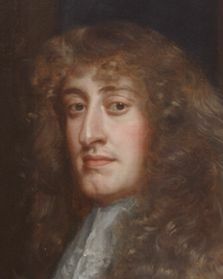 James, Duke of York, later James II. The LONDONERS Lamentation, a broadside ballad published in 1666 giving an account of the fire, and of the limits of its destruction. Click on the image to enlarge and read. John Evelyn's plan, never carried out, for rebuilding a radically different City of London. Christopher Wren's rejected plan for the rebuilding of London. Great Fire of London Facts for Kids. Kiddle Encyclopedia.